Interested in being among the first to register for the 2019 Race for Every Child? Email us here! Register Today for the Race that Makes a Difference Held in the heart of the nation’s capital, the Race for Every Child is perfect for avid runners, weekend joggers, parents looking for a fun activity for their family, or anyone who wants to help ensure that every child can receive exceptional care. Join us for this Saturday like no other, where kids are at the center of it all. Run as an individual. Run as a team. Race for every child. A team photo area, kids activities, and mascots will all be ready for race day fun. Awards presented to the top fundraisers, teams, and finishers. Learn More about this year’s recognition items to thank you for helping us ensure every child can grow up stronger. Looking for info you don’t see here? Check out our 5K Run/Walk FAQs. Superheroes. Dr. Bear medals. Every kid is a winner in the 100-yard Kids Dash! Kids aged 3 - 10 can sign up to dash and participate in the 5k for no extra charge. Just one city block long, the Kids Dash route is right on Pennsylvania Avenue, starting at 12th Street, NW, and finishing at 13th Street, NW. Begins promptly at 10:15 am, following the conclusion of the 5K run/walk. Kids will run in waves, based on their age group. Children ages of 3 to 10 are eligible to participate in the Kids Dash. For safety reasons, PARENTS WILL NOT be allowed to "dash" with their child (unless under special circumstances). There will be a kids area during the event full of games and activities. Kids Dash participants will receive a T-shirt, Dr. Bear Medal and Kids Dash Bib! congratulations after the finish line. Looking for more details? Don’t skip our Kids Dash FAQs. With so many races in D.C., why choose ours? Your participation in the Race for Every Child directly supports care and research at Children’s National, your local pediatric hospital. 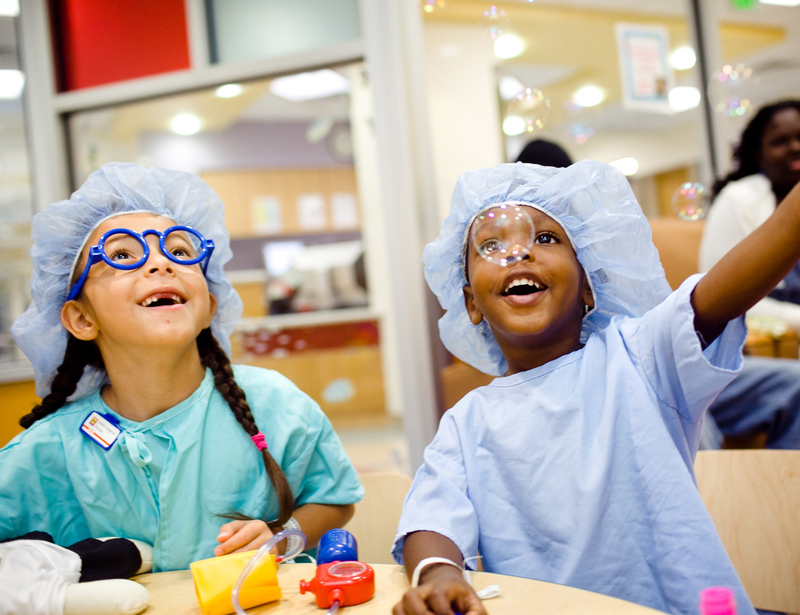 Providing life-saving care to more than 230,000 kids annually, Children’s National is ranked among the top 5 children’s hospitals in the nation and #1 for babies. At Children’s National, our doctors, nurses, researchers, and staff understand what it takes to treat the whole child, no matter what the injury or illness. From broken bones and asthma attacks to pediatric cancer and rare genetic diseases, we are dedicated to ensuring every child can live healthier and grow up stronger. 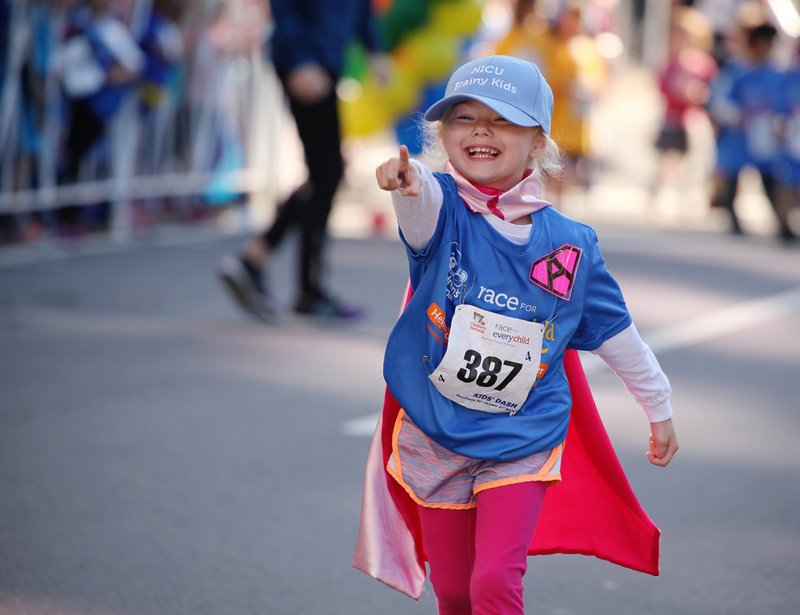 The Race for Every Child is a Saturday like no other that brings together patients, families, hospital staff, and members of the community to celebrate and support this commitment to pediatric care. 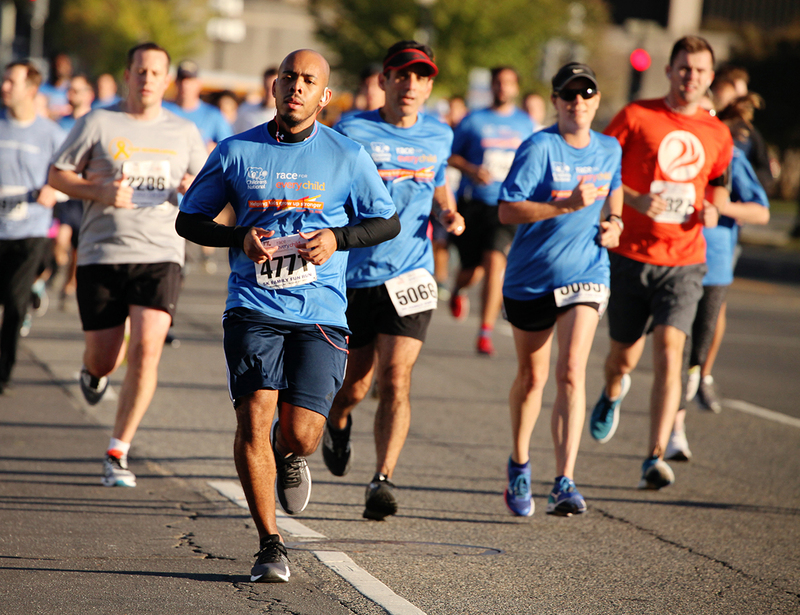 Participants and the friends, family members, and co-workers who support their race efforts raise much needed funds that ensure we can continue to pursue tomorrow's cures while providing children with the medical care they need today. Participant fundraising and race donations support the Fund for Every Child, which funds every area of Children’s National, giving us flexibility to meet our greatest needs and ensuring that every child, from every background and walk of life, can receive exceptional care, regardless of insurance or ability to pay. The Race for Every Child has a real impact on children in our community. Meet some of the kids and families whose lives have been changed by their time at Children’s National, and hear firsthand what the Race for Every Child means to them. The resilient children we treat and their families inspire us each and every day with their stories - we know they’ll inspire you, too! Meet kids benefiting from your support! From treating broken arms and asthma attacks to fighting cancer and rare genetic diseases, Children’s National is there for the kids in our community. Hear firsthand from some of the families we care for. What is Children's National able to accomplish thanks to the commitment of Race for Every Child participants and the generosity of their supporters? With more than 1,100+ active research projects, Children’s National is helping find cures for childhood diseases and so much more! Learn more about how your support helps us care for kids. Advanced packet pick-up and race day pick-up is available for all 5K and Kids Dash participants but we highly encourage you to pick up in advance. You will be able to find your bib number on our site and via email starting race week (knowing your bib number in advance will expedite the process). Bib numbers will not be available prior to race week. J.W. Marriott in Washington, D.C. If you reach $2,500 in team fundraising you will have the option of having your team’s packets mailed to you! *for delivery on Oct. 18. Please note that if you opt by October 1, 2018 to have the packets mailed to you, we kindly ask that you communicate this news to all of your team members to avoid confusion on race day. Packet pick-up on race day will begin at 7:00am in the Packet Pick-Up tent located on Freedom Plaza. Knowing your bib number in advance will expedite the process (bib numbers will be made available the week of the race). Sponsor area on Pennsylvania Ave. Bag check will be located on Freedom Plaza and will be open from 7:00 am to 8:15 am. Participants must place their belongings in the clear bag that they will receive at packet pick-up. We cannot accept backpacks or other large items. All checked bags must be picked up by noon. If you have any cash or check donations, please bring them with you on race day and drop off at our donation tent. Collection envelopes will be available at packet pick-up and at the race. Recognition items will not be available for pick-up on race day. Two-three weeks post event, eligible participants will receive a redemption certificate email. The email will include instructions on how to redeem a recognition item on the Race for Every Child Recognition Website. Learn more about how you can qualify for our fun Race for Every Child items. Visit our merchandise tent on race day, and take home our awesome Race for Every Child swag items! Cash and credit cards will be accepted. If you are pushing a child in a stroller, take extra caution. Line up toward the back of the starting line where you will enjoy the companionship of others with strollers. If you’re running with a racing stroller, seek out the less crowded parts of the roadway, especially during the first half mile. Volunteers with pace markers will be in place to provide you guidance when "self seating" at the start line. 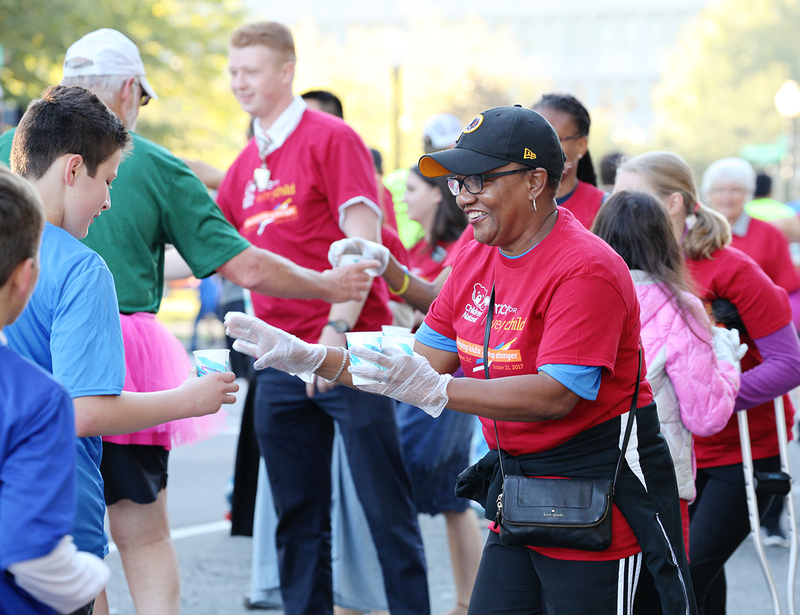 All race participants are invited to use our free shuttles that will be running between Children’s National’s main campus at 111 Michigan Ave. NW and Freedom Plaza. Paid parking is available at our Sheikh Zayed campus. We encourage event participants to use the metro to travel to and from Freedom Plaza. Please note that the metro will not open until 7:00 AM, so we encourage you to pick up your race packet in advance in order to avoid long lines and eliminate the possibility of missing the race start. Check train times and information about shuttle service, parking, alternate routes, and track work at www.MetroForward.com or call 202-637-7000. There is no exact address for Freedom Plaza. When using GPS, please use the intersection of 13th Street and Pennsylvania Avenue, NW. Children’s National & Colonial Parking® have partnered to offer discounted parking to the Race for Every Child runners and attendees, via online reservations. A link will be available closer to race day to reserve your guaranteed parking space. If you are driving, please leave extra time to park and walk to the site. For more information about the parking and location, please click here. We are excited to offer a bicycle valet service this year for those participants arriving by bike. Please look for Two Wheel Valet on 13th Street, NW off of Pennsylvania Avenue and E Street. Do I have to fundraise? Is there a fundraising minimum? There is not a required fundraising minimum. All participants are encouraged to set a minimum fundraising goal of $250! Team captains are encouraged to set a goal of $250 per team member. Does my registration fee count toward my fundraising total? No. Your registration fee helps cover the cost of planning and managing the race. It is not tax-deductible, does not count toward your fundraising total, and is not reflected on your fundraising page. Can I collect offline donations? Include an offline donation form with your check(s) payable to “Children’s Hospital Foundation.” Be sure to include your name and team name so you and your team get credit. It may take up to seven business days for your donation to process and appear on your fundraising page. I see that my employer matches. What should I do next? Follow the "Procedure" steps as listed in the search information. My donor submitted the matching gift request but it’s not showing up on my fundraising page. Each company has a different payout schedule. Some prefer to payout matches monthly while others send disbursements biannually. Please see the company policy for specific disbursement schedules. If the company claims that the match has been sent, please email us at info@raceforeverychild.org to ensure it is properly allocated to your fundraising page. If the donation is restricted, will the corporate match be restricted? Yes. In most cases, you can designate a fund when submitting the matching gift request. If the check doesn’t list a fund, the matching gift will be restricted to mirror the designation, appeal, etc. of the initial gift. If we are unable to determine the original gift due to lack of donor detail in the report, or if the donor wants to remain anonymous, we will then use the listed designation on the check (if applicable) and the matching gift appeal that corresponds to the current fiscal year. We only deviate from the original gift designation when explicitly stated by the matching gift company. How do I order my recognition item? A few weeks after the Race for Every Child, eligible participants will receive a redemption certificate email. The email will include instructions on how to redeem a recognition item on the Race for Every Child Recognition Website. I continued to fundraise after the event. What do I do if my redemption certificate was issued for the incorrect level? Please contact the race team directly at info@raceforeverychild.org. Once the correct fundraising total is confirmed, we will reissue your redemption certificate. I registered more than one person with the same email address. Will we all receive a redemption certificate email? One certificate will be sent via email, addressed to a specific participant. The remaining participants will receive their certificates in the mail. Am I able to redeem for items below my fundraising level? Participants can redeem 1 item from their earned fundraising level, or 1 item from a lower fundraising level. Recognition items are not cumulative. Top finisher awards (open division) will be presented to the top three male and female finishers on-stage. Age group division awards must be picked up at the Results Tent. 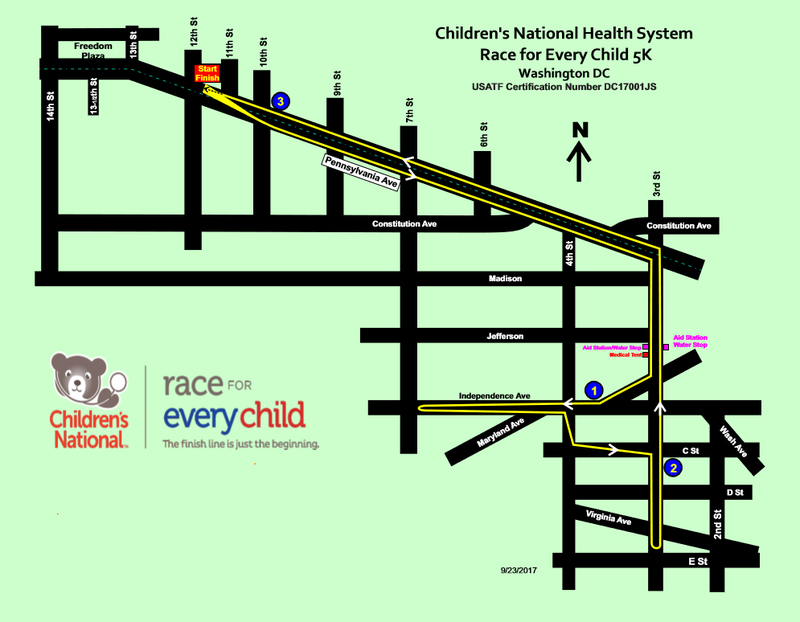 If I cannot attend the race, can I still support Children's National? You can donate in support of a team or individual participating in the Race for Every Child by visiting our donation page and searching for their individual or team name. You can also register and participate virtually. Select the “virtual” participant option, personalize your fundraising page and make an impact! Send us an email at info@raceforeverychild.org to receive a t-shirt post-race. No. Our permit requires that all 5K and Kids Dash participants register in advance. The last day to register is Sunday, Oct. 14 at 11:59 pm. I registered and can no longer attend the event. Can I receive a refund or transfer my registration to someone else? No. All registrations are non-refundable. To protect your identity and accurately reflect results, we do not allow participants to transfer bib numbers. When and where can I get my race packet? You can get your packet at the check-in tent on race day, but we encourage you to pick it up in advance at one of our packet pickup locations. When and where can I get my race t-shirt? You can get your shirt at the T-shirts tent on race day, but we encourage you to pick it up in advance at one of our packet pickup locations. If you are driving, please leave yourself extra time to park. Plan to arrive at 7:00 am if you need to pick up your packet on race day. See full schedule. Can I participate with a stroller or in a wheelchair? Strollers and wheelchairs are welcome. For safety reasons, we encourage those walking or pushing wheelchairs or strollers to line up at the back where you will enjoy the companionship of other walkers and strollers. Your Chronotrack B-Tag transponder will record your time from the moment you cross the starting line to the time you cross the finish line. If you’re running with a racing stroller, please seek out the less crowded parts of the roadway. Volunteers with pace markers will be at the starting line to help you "self seed." See parking, driving, and other transportation information. What age does my child have to be to participate in the Kids' Dash? Children between the ages of 3 and 10 are eligible to participate. How much does it cost to participate, and what will my child receive? There is a $15 registration fee for all Kids' Dash participants. The registration fee includes a race t-shirt, Dr. Bear finisher medal, and access to all family activities. Is the Kids’ Dash timed? The Kids’ Dash is not a timed event. Can my child participate in the 5K too? If you register your child for the Kids’ Dash, he or she can participate in the 5K for no additional fee. Please note that Kids’ Dash bibs do not have a timing chip, so if your child wants to receive a finish time for the 5K, ask for a 5K bib when you pick up your packet. Can I participate with my child? Where can I watch my child in the Kids’ Dash? There will be a Parents Lane roped off on the south side of Pennsylvania Avenue. After you watch from this area, you can go to the meet and greet area to see your child. What time will my child dash? To keep the course safe, participants will run by age group, starting with the youngest runners. All Kids’ Dash participants will receive an age group sticker with their race packet, and children will be organized into the following age groups: 3-4, 5-6, 7-8, and 9-10. Participating as a team is the best way to experience the Race for Every Child, fundraise, and make an impact. Choose a creative team name and plan fun ways to engage your team members. Teams range from two people to as many as you’d like. There is no limit the number of members on a team. Who can be on my team? Reach out to family, friends, neighbors, and co-workers. Whoever you want to invite is welcome to join your team! Contact the race team at (301) 565-8571 or email us at info@raceforeverychild.org for more information. 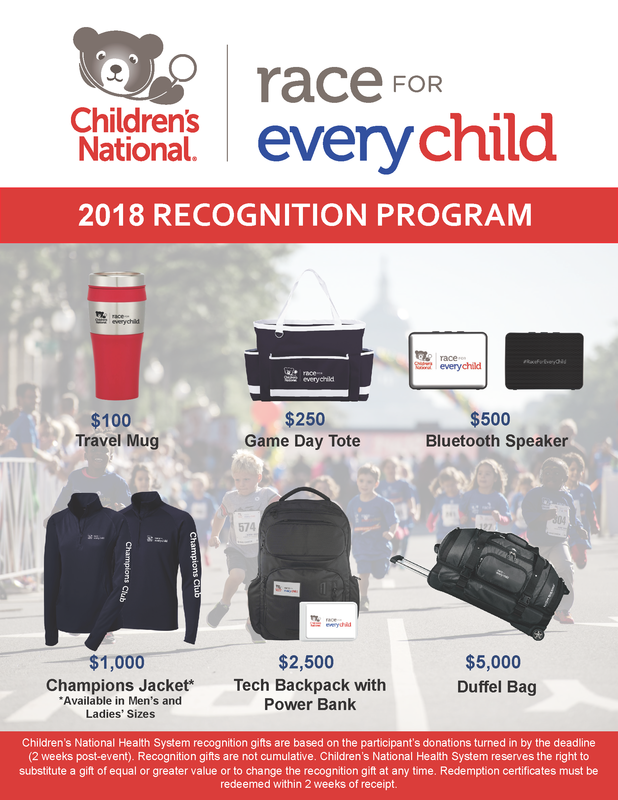 Sponsoring the Race for Every Child is an exciting way for your company or organization to support Children’s National and help kids grow up stronger. 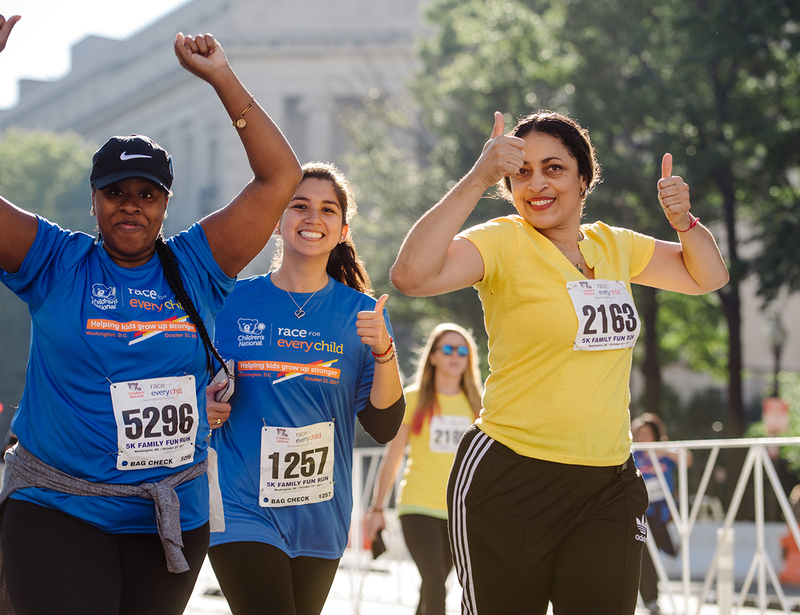 As a sponsor of the Race for Every Child, you will make a direct impact on the health and well-being of children in our community, in addition to elevating your company’s visibility throughout the D.C. metro area and providing high-level engagement opportunities for your employees and families. HGA The Korth Companies, Inc.
Gensler JP Morgan Chase & Co.
LT Transportation Network Designs, Inc.
To recognize your leadership and generosity in supporting children, we offer several exclusive Race for Every Child items. If you qualify for an item, you will receive an email to redeem your selection, which will be mailed directly to the address provided in your registration. $2,500 Avoid race day lines! Your team’s race day packets, shirts, and bag check bags are mailed to you, the team captain, and delivered before/on October 18. When you achieve this level, please be sure to tell your team members that you will distribute their packets. $5,000 On race day, your team will receive an Official Team Photo timeslot and a hand-held sign for you to use while you race! $10,000 In addition to the benefits at the $2,500 and $5,000 levels, your team will also receive a 10 x 10 tent on race day adorned with a hanging team sign! This is a great place to host a team breakfast, have a gathering space, and get excited about the race. We will also provide one unloading pass that you may use before 7 a.m. to get your supplies to your tent. Thank you for your interest in volunteering for the Race for Every Child! We rely on hundreds of volunteers every year to ensure our event runs smoothly and our participants have the best experience possible. To go to Race for Every Child 2018 volunteer registration page, please click here. Also, if you are interested in learning more about volunteering, please contact info@raceforeverychild.org or call (301) 565-8571.